The historic core of Fez and the seat of the Moroccan government until 1912, Fez Medina (Fez el-Bali) remains the city’s biggest draw – a sprawling district of jumbled souks and snaking alleyways, dotted with grand mosques, palace and madrassas. The old medina is now a protected UNESCO World Heritage site, still surrounded by its 13th-century city walls and reached via a series of monumental gates, most notably the 20th-century Bab Boujeloud, celebrated for its striking blue tilework. 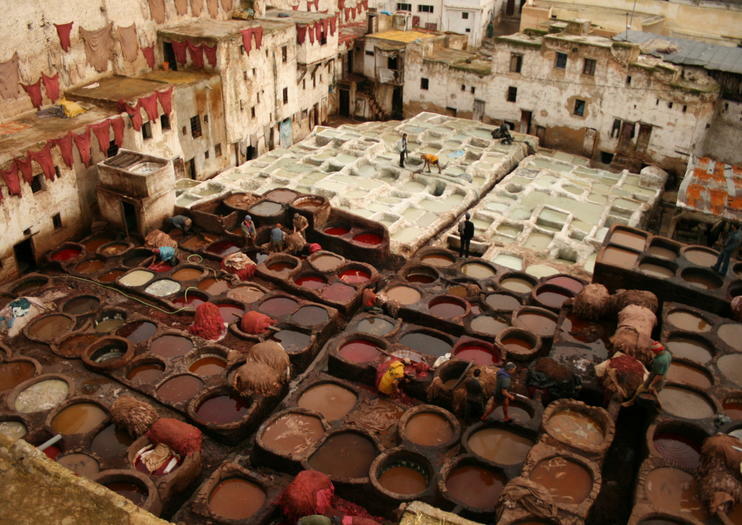 With the medina largely pedestrianized, the best way to explore Fez Medina is on foot and there’s plenty to see, starting with the rambling souks, home to the famous Tanner’s Quarters, the soul of the city’s leather trade, where animal hides are soaked in gigantic pots of natural dye. Additional highlights of Fez el-Bali include the Kairaouine Mosque University, known as the world’s oldest university and dating back to 859; the exquisite Madrassa Bou Inania and Al-Attarine Madrasa; the Talaa Kebira water clock; and the Mellah Jewish Quarter. Fez Medina (Fez el-Bali) is located northeast of Fez el Jadid and the Ville Nouvelle in central Fez. Fez cooking class help you sense the beauty of Morocco by tasting its most irresistible dishes and learning the secrets of its spectacular cuisine. A guide is essential when it comes to navigating the narrow streets of Marrakech’s historic medina (old town), not least because they can fend off the hustlers and carpet touts. Soak up all the magic of Marrakech by night on a private walking tour with just you and your guide. Exploring from the Djemaa el Fna, enjoy musicians, snake charmers, and dancers, sip tea or coffee, and savor traditional snacks. Private tour that takes you from North of Morocco, Tangier, into this heart of the Rif Mountain Chefchaouen, Explore Morocco's incredible imperial cities of Marrakech, Fes, Meknes and Rabat on this 7-day tour from the Tangier. Visit royal palaces, historic monuments and many more of the country's amazing sights. Explore Saharan dunes and mountain kasbahs on a private, 3-night 4WD tour from Marrakech to Fez. Wind up Tizi n’Tichka pass into the High Atlas to discover Ourzazate and Ait-Ben-Haddou, then bask in the alpine sun of the Dades Valley. Slip into lofty gorges and climb the towering dunes of Erg Chebbi; watch the sun slip behind the sand and sleep beneath the stars in a traditional nomadic encampment. Trade the 4WD for a camel ride before continuing into the Middle Atlas, and the ancient city of Fez. Discover the magic of the Sahara desert on this 3-day tour from Fez. Ride a camel through the dunes, spend the night in a desert camp, and watch the sun come up over the sand. This trip also includes lunch in a Berber village, travel through the Atlas Mountains, and a tour of scenic Rissani.